I am always searching for books related to witches, because they're one of my favorite things to read about. 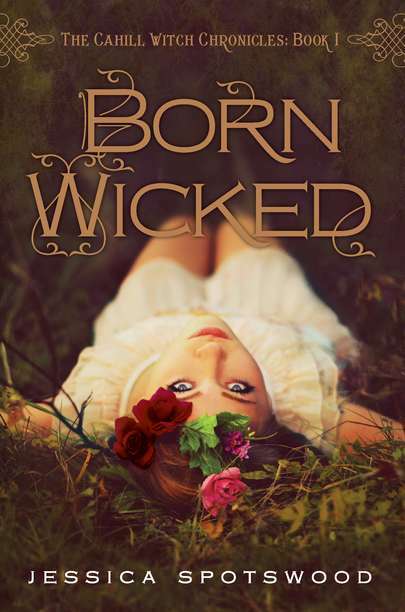 Born Wicked was different than other books of witches that I've read because its set in the late 1800's, an era that I am not familiar with and rarely read books set in that time. With Born Wicked, I liked that it wasn't set in present day so that we not only get to know about Cate and her sisters powerful abilities but also the practices and traditions of the olden days. When girls were supposed to look pretty for their husbands and being smart was frowned upon. In Cate's home town of Chathum, the Brotherhood rules. Females of every age must be very careful of what they say or do for fear that the Brotherhood believes you are a witch and takes you away to an asylum or a prison ship. Thus, Cate is overprotective of her sisters and must protect them at all cost because that is what her mother told her to do. She must learn how to deal with the prophecy her and her sisters are most likely a part of, all the while juggling social gatherings and not fall for Finn Belastra. Cate's character starts off as timid and antisocial but very caring. The beginning of the book was a bit slow, as we get to know the characters and what happened when the Cahill sisters' mother died. Nothing too exciting happened. Later on, as Cate learns more about her role in the prophecy, she realizes she has a very difficult choice to make; get married or join the Sisterhood. This decision is difficult because all she thinks about is what's best for her sisters. As the story builds up, Cate's character changes as well. She becomes a feisty and mature young lady who owns up to her role of lady of the house and not afraid to speak her mind. This change in character was nice to see. There were plenty of plot twists and keep you on the edge events that occurred during three quarters of the book. It got good and addicting. Throughout this book you will put yourself in Cate's shoes and ask yourself; what would you do if you were Cate? I need to pick up the second book and find out what happens to Cate and her sisters!